Since losing my dad last month, I’ve been struggling with a lot of different emotions. I wasn’t feeling the Christmas spirit, but I didn’t want to spend the holidays by ourselves either. Fortunately, our dear friends in Scotland invited us up to spend Christmas with them in the Scottish Highlands. Perhaps you remember my last visit here when I was hand-feeding reindeer in the Cairngorms National Park? When you live far away from family, your friends become like your family. Living as an expat for the past eight years has taught me that you can always rely on your friends - your good friends. True friends don’t judge you. They give you a shoulder to cry on when you need it and give you a glass of wine (or two or even three) to cheer you up. That’s what I needed this Christmas season. We spent three nights cooking, eating, drinking, sitting around a warm fireplace, taking long hikes and talking with our friends – surrounded by the rugged Scottish Highlands. It was a relaxing wee break after I had just worked six days in a row. And absolutely what I needed! I’ll close this year with some photos from a beautiful part of Scotland. Here’s hoping that 2019 is a happier and healthier year than 2018 ended up being. Four shadows of four friends hiking on Christmas Day in Scotland. Looking back through my photos from this year, I stumbled upon our morning visit to one of the most famous markets in Venice. The Rialto Market, located in the heart of Venice along the Grand Canal, is a popular area where local vendors sell fresh produce, seafood and spices. Even if you are a tourist, the market is the perfect spot to pick up an afternoon snack or even some foodie goodies to take home. Of course, I love taking photos and simply wandering through a good market as well. Visiting a market is one of the best ways to see the city’s vibrant social life and as well as hang out with the locals a bit. The market, which has taken place since 1097, is open every day except Sunday and is housed in a 16th-century building. 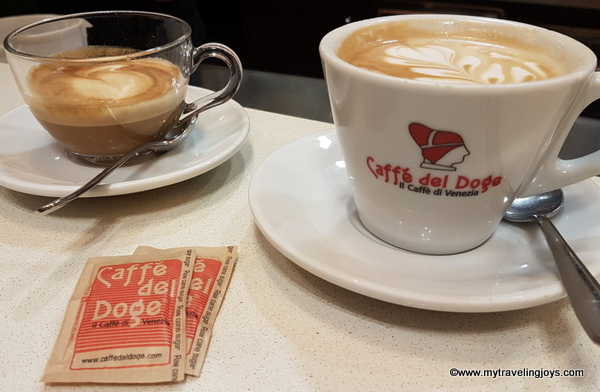 If you are visiting Rialto Market, I would recommend first having a coffee at Caffè del Doge. This popular coffeeshop also served as the city’s first coffee bean roasting facility, which was founded in the early 1950s by Sir Ermenegildo Rizzardini. Today, the shop exports its delicious roasted beans around the world. At the market itself, you’ll find a wide variety of stalls selling just about anything you could want to whip up a meal – cured meats, fresh seafood, beautiful veggies and lots of local citrus too. For travelling purposes, I found several spice blends costing 3 for 9 euros that I bought. I can honestly say that I have used the tartufo blend and a spicy hot chili blend to flavor different pastas and have been truly impressed. Yum! I almost wish I had purchased a few more spices. 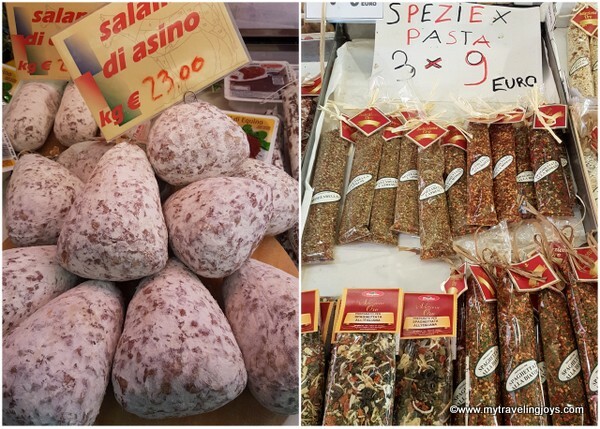 Wandering through a fresh market is always one of my favorite pastimes wherever we travel, and Venice was no exception. have old columns with fish motifs on them! I love this "green cauliflower!" See one of my favorite recipes: Romanesco Broccoli with Turkish Olives. How pretty are these purple Italian artichokes at Rialto Market? If you're baking this holiday season, perhaps you'll enjoy making some of my cupcake designs that I've made over the years. In the past, after I posted a few photos via Facebook and Instagram, several readers requested directions and my cupcake recipe, so here you go! I'm currently travelling for the holidays, so this post will serve as a rough draft for the time being. Roll out white fondant thinly and cut out snowflake shapes using small cookie cutters. Then, make a white Royal Icing and decorate the snowflakes with various dots and lines. Let the snowflakes dry at least 24 hours before using on your cupcakes. I thought these cupcakes looked extra cute with a pale blue buttercream! Roll out yellow fondant thinly and cut out star shapes using small cookie cutters. Then, pipe your green buttercream with a large star nozzle. Use white icing, marshmallows and desiccated coconut to create your own polar bear. Use buttercream and large white marshmallows to carefully construct your own snowmen. Using an electric mixer with a paddle attachment, place these ingredients in mixing bowl and blend together. 1. Then, add the sifted dry ingredients to the wet ingredients. Beat all ingredients together for a 1 minute or so until smooth and satiny looking. 2. Line a cupcake baking tray with paper baking cups. Fill the paper cups about 2/3 full (Use a no.16 cookie scoop or a large spoon). 3. Bake in a preheated 350 F/175 C oven with the fan on for 15 minutes until lightly golden on top and a toothpick or cake tester inserted in the middle comes out clean. Let cool on a cooling rack. 16 oz. (455 g.) butter, room temp. Prepare Italian Meringue, cooking sugar to 120 C (softball stage). Place sugar in pot with water, stirring to moisten sugar evenly. Wash sugar off sides of pot with damp pastry brush. Cook to softball stage while whipping whites to soft peaks. Time this properly so that the whites don’t get overwhipped. When the sugar syrup is ready, turn the whites to high and carefully pour the sugar down the side of the mixing bowl. Continue whipping the whites until they have cooled somewhat, about 10 minutes. Slowly, add the butter a bit at a time. Continue whipping until the buttercream is smooth and fluffy and completely cool. Buttercream can be flavored with melted chocolate, lemon zest, lemon juice, other flavor extracts. Prepare to be envious, smitten and perhaps a bit hungry after you see some impressively sweet gingerbread houses here in London. We recently headed over to the V&A Museum, which is hosting the third annual Museum of Architecture’s Gingerbread City. This exhibition invites local architects, designers and engineers to create an entire city made of gingerbread, royal icing, sweets and other edible delights. Since I work as a pastry chef, I was desperate to see this tasty exhibit, but all the weekend slots were always sold out. I work erratic hours so can’t always plan in advance to attend exhibits like this. Previously, we had missed the Winnie the Pooh and Frida Kahlo exhibitions, so we finally signed up to become V&A members. As members, we can see any exhibit for free and there’s no need to book a reservation in advance. Winning! The V&A membership isn’t cheap, but we figured it’s something we will take advantage of and take guests with us when they visit London. The Gingerbread City is a delight to one’s senses as the crowded room is filled with the pleasing scent of cinnamon and ginger and visually the flickering Christmas lights. I oohed and awed my way around the room admiring the use of tic tacs, liquorice ropes, marshmallows, Life Savers and other sweets for decorations as well as the crafty way of using professional gelatin sheets to create window panes. If you love to bake, then you should definitely see this exhibit, which continues through January 6th. If you can’t hop on a plane to see Gingerbread City, then I hope you’ll enjoy my photos in this post. Now, if only I had a computer program and laser cutter to make my gingerbread house designs. Perhaps, next year. Which gingerbread building is your favorite? Clever use of gelatin sheets for window panes here at the Recover Bee Centre. I really like this one as it’s designed by the Zaha Hadid Architects in London. http://www.zaha-hadid.com/ Zaha Mohammad Hadid, an Iraqi-British architect who died in 2016, is well-known for her interesting architectural designs around the world such as the London Olympic Aquatics Centre and the Guangzhou Opera House in China. She was the first woman to receive the Pritzker Architecture Prize, in 2004, and she received the UK's most prestigious architectural award, the Stirling Prize, in 2010 and 2011.